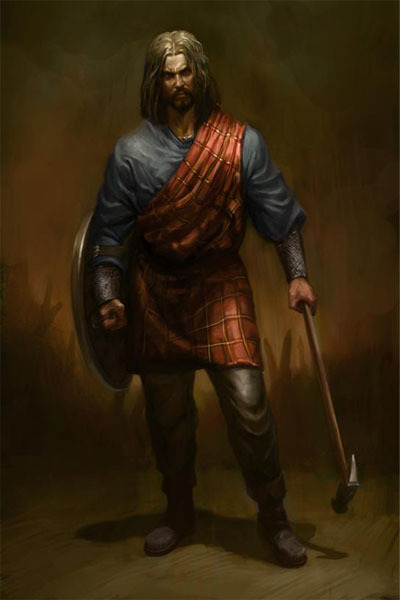 William Wallace is known as Scotland’s liberator having spent his adult life in guerilla war against the English. His outlaw career began when he killed an English constable’s son in a street fight. Wallace was found while secretly visiting his bride and new child, forcing a bloody escape. The sheriff executed his wife as retribution. Wallace returned that night killing every Englishman in town. At Stirling Bridge Wallace’s band waited for the English army to cross the narrow span. The Scots attacked, the English couldn’t mount a defense on the marshy ground, and were killed nearly to a man. After the victory at Stirling, Wallace spent the Autumn raiding and pillaging. Early the following year (1298) he was knighted and named the Guardian of Scotland. He now led all of Scotland’s armies. In July, 1298 he met the English armies at Falkirk. Wallace’s spear walls held, but his horsemen deserted, leaving his archers open to attack by the English cavalry. Wallace’s losses were near total. Wallace never rebuilt his army, spending several years as an outlaw. He was captured in 1305, and was sentenced to be hanged, drawn, and quartered in a trial that lasted less than a day. Warhammer and Shield: A war hammer had a medium length wood shaft with a double sided head. One side was a hammer (often with points) and the other a spike. These were used to crush, and were effective against plate armor. Unlockable Weapon: Scottish Broadsword: The basket hilted broadsword’s defining feature was the hilt. The standard crossguard evolved into a complex basket that protected the hand. In most Scottish examples the basket was lined with velvet. Claymore: A claymore was a long, two-handed sword with a straight handle, and two straight guards that angle forward. They were heavy (though balanced) and not sharp- enemies were knocked down then stabbed. Unlockable Weapon: Greatsword: The greatsword was like a knight’s sword on steroids. 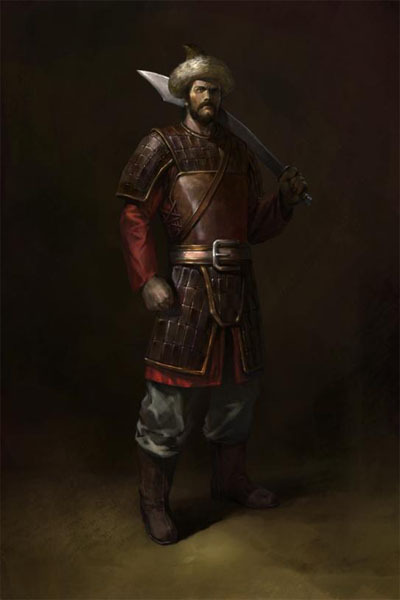 The long, heavy blade was balanced by a large grip, pommel and crossguard. The wrapping above the guard allowed for a variety of hand positions. Ettrick Longbow: The gastrapheteshad two heavy, composite limbs and a trigger. It was cocked by pressing the center protrusion in the ground using the archer’s weight, and was fired from the waist or hips. Unlockable Weapon: Ettrick Shortbow: Staves of lesser quality yew were laminated into short bows that were used by the archers living near Ettrick Forest. Their range and impact was less than longbow, but they were easier to shoot. Chainmail: Made of interlocking rings chainmail was effective against slashing attacks, but not bludgeoning weapons. It was also of limited usefulness against piercing attacks. Leather Cuirass: A leather cuirass protected from the shoulders to the hips. They were made by laminating plates of leather and linen to form a hard, tough shell. They were left plain, studded or with lamellar plates. Click here for the full Deadliest Warrior Legends Roster.